Aqaba at Lower Parel’s fashionable corporate address, Peninsula Business Park is any gourmet’s delight. A sprawling, 3000 sq. ft. restaurant with 1000 sq. ft. al fresco section, high ceilings and elegant décor, this restaurant is named after the quaint and picturesque coastal city in Jordan. Aqaba’s menu, both all day dining and the Aqaba specialty menu, is an amalgamation of dishes from Greece, Turkey and Lebanon with provincial specialties from Southern Italy, Spain and Northern Africa. Fairly exhaustive, it is an exercise in choices, given the variety. The outdoor al fresco section (currently not operational owing to the Monsoons) offering world cuisine overlooks lush lawns and provides a peaceful sanctuary throughout the day to its patrons. At sunset, the space gradually morphs into a lively tapas bar. I cannot wait to experience that. 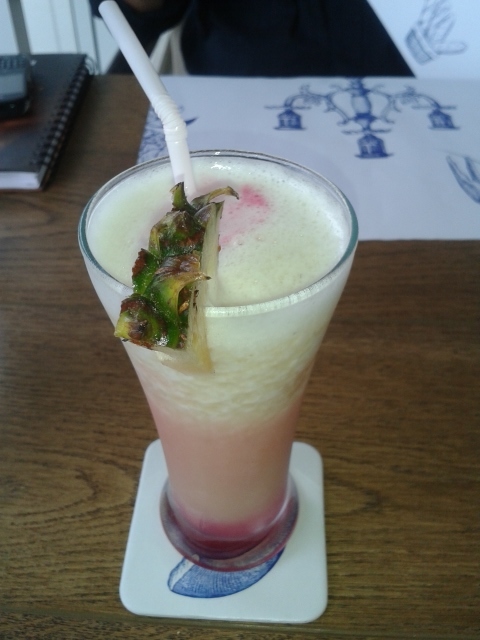 Tropical, the pineapple juice based drink with a hint of banana and lemon was refreshing and unique. An interesting blend of flavours and not cloyingly sweet. 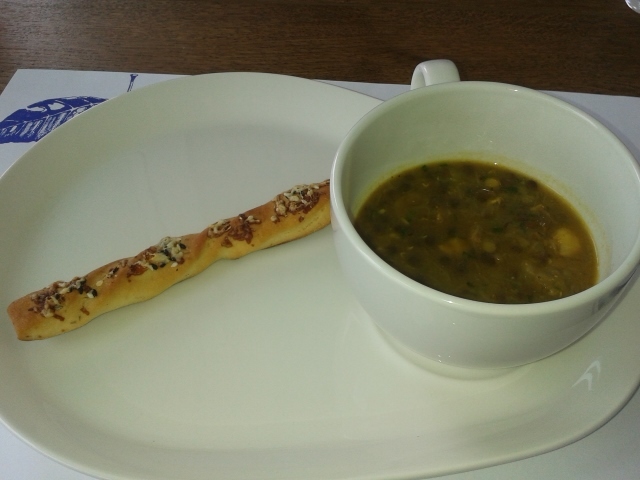 Soup Harrira, was a simple, flavoursome Moroccan soup, with a lentil base and lamb pieces. Nourishing and nutritious. Loved it. The presentation was equally a fest for the eyes. Our Spinach Roca salad cam next but was a bit disappointing as the quantity of goat cheese was highly inadequate. That in fact lead to the bitterness of the leaves in the salad getting accentuated. 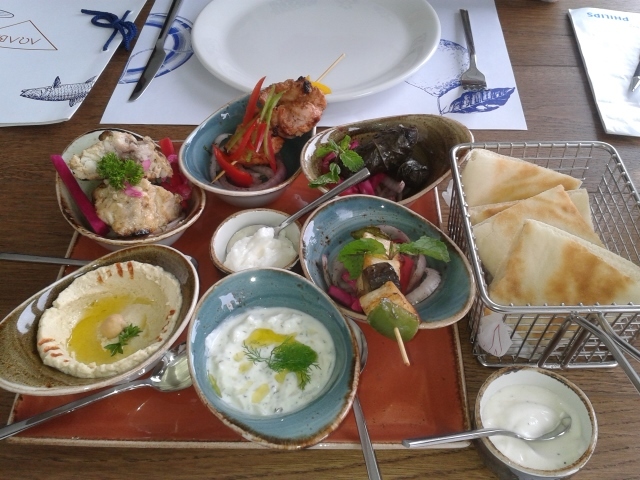 The elaborate Mezze platter with six varieties more than made up for the salad. Shish touk the flame grilled chicken skewers were well-marinated. Samak Meswi, the grouper fillets grilled to perfection and served with tomato, preserved lime and garlic were mouth-watering. The fish was of a flawless texture, not disintegrating as in some places it does. But the highlight of the platter undisputedly was the lamb dolma. Grapevine leaves stuffed with rice, lamb, nuts, mint and garlic, steamed and served with a lip-smacking dip. I could satiate myself with these alone. The garlic tzatziki had the right consistency and ingredients and was one of the nicer ones I have tasted. By now, our palates had been sufficiently wowed and could only get better, I was certain. And it did. 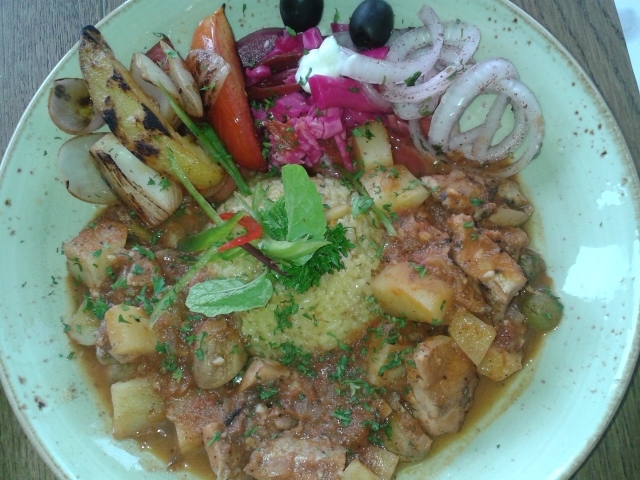 Kotopoulo Stifado aka cinnamon flavoured chicken stew with mushrooms, potatoes, olives, tomatoes, onions served with an Aqaba pilaf was heavenly. Its aroma filled my nostrils as it arrived on the table. A spoonful of it and we were transported into another world. Absolutely delicious. The food at Aqaba surpassed my expectations and the service was flawless too. I only felt that the food its great quality notwithstanding was a wee bit overpriced and thus not exactly value for money. Especially the Kotopoulo Stifado. The quantity was not extraordinary, neither the ingredients exotic, to merit that kind of a price. Overall, an enjoyable dining experience and Aqaba is definitely going to be the first choice of many a gourmand in Mumbai and visitors alike. Me included! Watch out For This Treesome! The Treesome Cafe in Andheri West, Mumbai definitely looked like a cool and happening place an was abuzz with people on Friday night as we stepped in. The outer portion was distinctly reminiscent of TLD. Yet the decor was totally different. We opted for a table inside. The funky names and the interesting descriptions in the menu immediately caught my eye. Cupcake Shrooms aka mushrooms stuffed with cottage cheese, chilli and sundried tomatoes served just like sweet cupcakes. Cute to look at and delicious as well but a lil’ impractical to handle and eat. They were so wobbly that the lower portion would just fall apart. I even shared this with the chef and he agreed. We sipped our Orange Lemon grass coolers which were heavy on orange juice but the lemongrass was conspicuous by its absence. Refreshing nevertheless. The Big Mezze with hummus, babaganoush, persian falafel, pita bread, et al was a gastronomic delight. Luscious flavours and interesting textures all in the same platter. The babganoush surprisingly got full marks as normally I am not a brinjal fan, Was well made indeed. The cous cous salad too was unique but the persian falafels did not impress me too much. Foot tapping music, audible but not noisy was playing and enhanced the charm of the place. I loved the platters on which the food was served. I loved the dish Gabar Singh, spinach, chill and cheese crostini, although I did not try those. Chicken Gangnam syle- the Korean grilled chicken was a complete washout as far as I was concerned. Though stylishly served in glasses, the texture of the chicken was too mushy, as if excessively marinated. Bokiba – the Maldivian fish cakes were unique and well made. Reminded me instantly of the fish balls one eats in Singapore. The sundried tomato chutney too was delectable. A good offering, I thought. The Chef is certainly creative and well travelled. The menu though limited has enough variety. The place is obviously meant to entice drinkers and it sure does. Food is secondary, yet not a run of the mill stuff. For those who are still hungry, burgers, pizza and main course choices abound. We settled to share a Butter chicken Risotto as frankly I have always eaten only the Italian ones. This sounded out of the ordinary. It surpassed our expectations. 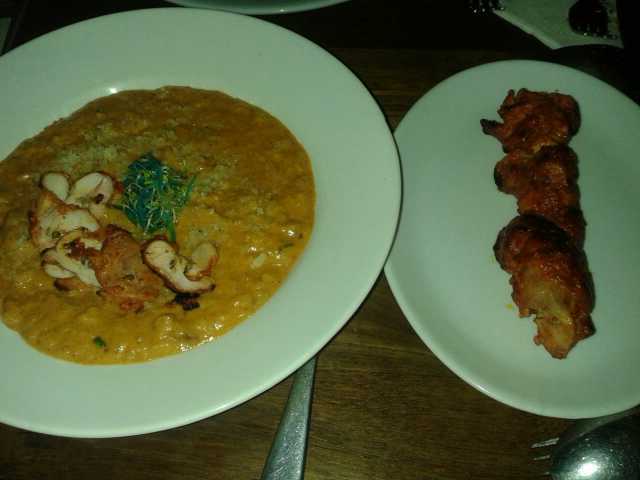 Well made, it was creamy and had the spicy chicken integrated well into the risotto and a grilled piece was served along side too. Pretty innovative! There was Lal Masala fish, Chicken Cafreal, Penne Vodka and much more to choose from. I know a place like this need not have dessert on their menu but I sorely missed it. It was a Friday night so they could be excused, but the service was a bit confused. But the quality of the food and drinks served is excellent, innovative and the place is pulsating and fun. Pebbles by Juhu Residency strangely has been a restaurant I have never frequented although it is located really close to where I live. I decided to remedy this last night. It is best known for its Indian char grilled, coastal & Pan Asian cuisine.. Inspired by the original recipes of India, Thailand and provincial China, it has an exclusive seafood menu that ensures that every catch is treated individually, blended with particular spices and herbs and cooked in a manner to retain its natural flavor. An entry into this fine dining restaurant on Link Road Andheri West was a surprise. Teeming with families on a Sunday night, the understated elegant decor and vibrant ambience energized me. Seated comfortably in a corner table, I explored the varied menu. Sea food across all cuisines was clearly their forte. But so were other vegetarian and non-vegetarian delicacies in Pan Asian, Coastal and Indian cuisines. 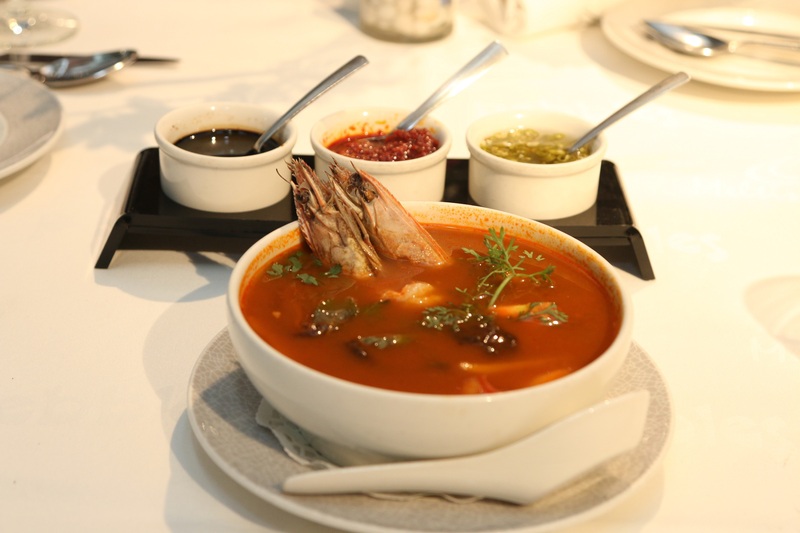 Spicy crab meat soup was recommended to us and proved to be the perfect choice in the current weather. Comforting and soulful, we lapped up this broth. There were generous amounts of crab meat in the soup. Steamed dim sums arrived next. Fish, prawns and crab meat were on our platter. Well steamed, light and with a succulent filling. The accompanying dips were equally interesting and added the right zing to our taste buds. 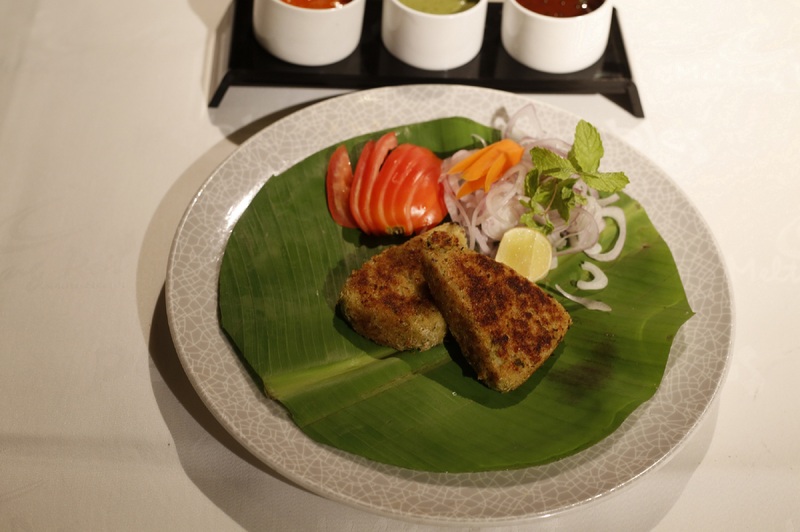 The tawa fry pomfret was a wake up call for our palate. The spice tantalized our taste buds and we relished the fresh, melt in the mouth fish, fried to perfection. Appams and chicken sukha along with Manglorean fish curry(Rawas) is what we opted for as main course. Could not have been a better combination. The appams were light and fluffy, albeit filling. The chicken was lip-smacking although rich in coconut, typical of the coastal region. The highlight was the tangy fish curry, with the right blend of spice and flavour. It paired well with the appams and we did not miss rice. Our palate was pleased beyond words. However desserts were inviting enough. Caramel custard is what we settled for. Rich and creamy, it was well set and had the right consistency and sweetness. Full marks to this one too. The service is good, efficient and unobtrusive. The staff is pleasant, well-informed and articulate. Overall the dining experience turned out to be better than I had imagined. The food is of high quality, with fresh ingredients, and only the best is served. The pricing at first glance may seem a little steep, but given the quality and the portion size, it is value for money all the way. If you are a gourmet who has discerning taste buds and wants to settle for nothing but the best, head to this restaurant. I am going back soon, for the extraordinary buffet lunch this time. I had heard so much about the delectable Ramzan food at Bhendi Bazaar in Mumbai where every year many of my friends and family head to savour the sumptuous spread. But somehow a trip there has always eluded me. So when the Saifee Burhani Upliftment Trust(SBUT) Mumbai very generously invited me for a food walk, I decided not to miss the opportunity in spite of the downpour all day yesterday. Nothing was going to deter me today, I thought. We were warmly greeted by the SBUT team at their office and shown around, after which we trooped to the streets armed with our umbrellas and folded trousers/ salwars. Our first stop was the Haji Tikka house where the aroma of charcoal grilled meats permeated our nostrils and made us hungrier. Chicken tikka, drumsticks, mutton sheekhs, kaleji et al were on offer. I relished only the chicken tikka and drumsticks. Mouth- watering stuff which had unique flavours that one can never find in a restaurant. Standing under a tin roof, by the side of the road, chatting and munching hot tikkas, to the sound of the heavy rain, was a rustic and memorable experience. Equally fascinating was to spectacle of the guy effortlessly and expertly moulding the kebabs and grilling them a la minute. Indian Hotel next door was the second halt. 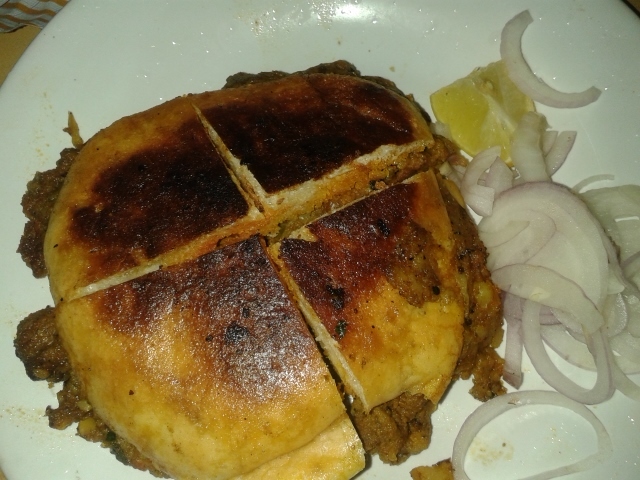 Mutton in all forms was served, Baida roti made of maida, eggs and mince, fried into crisp pieces. Lip smacking. 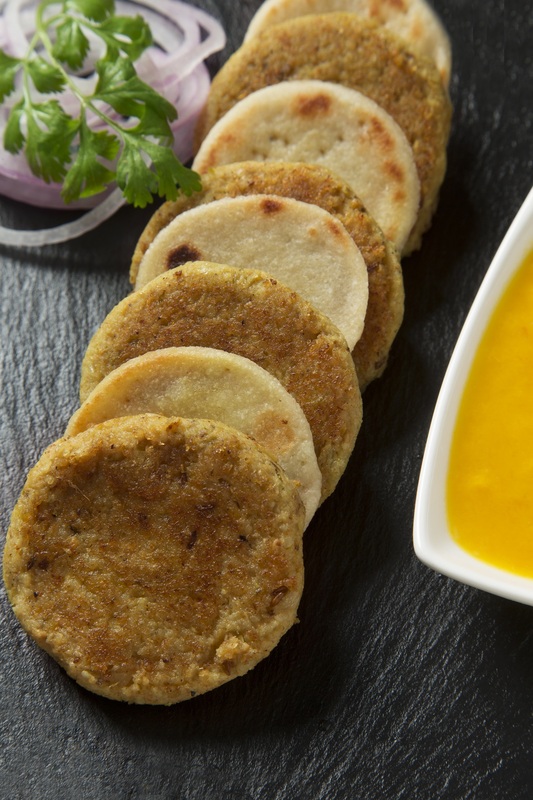 Similar to the Bengali moghlai paratha, though not exactly. 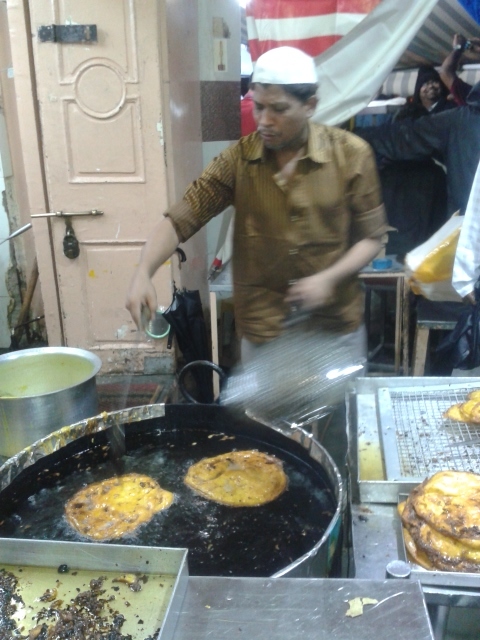 The naan chaap was more of a burger bun with the mutton chaap sandwiched in between. Tasty, but not extraordinary. The mutton roll cut into small pieces almost resembled a spring roll. Succulent pieces of mutton were rolled in a maida covering. The owner regaled us with anecdotes as we chomped on our food. About 180 kgs of mutton was used daily during Ramzan in the earlier days. He said chicken was a relatively new phenomenon as many people nowadays prefer chicken. But gourmets clearly come here to relish the meat delicacies. I could see that for myself as cars stopped and people kept entering the place. 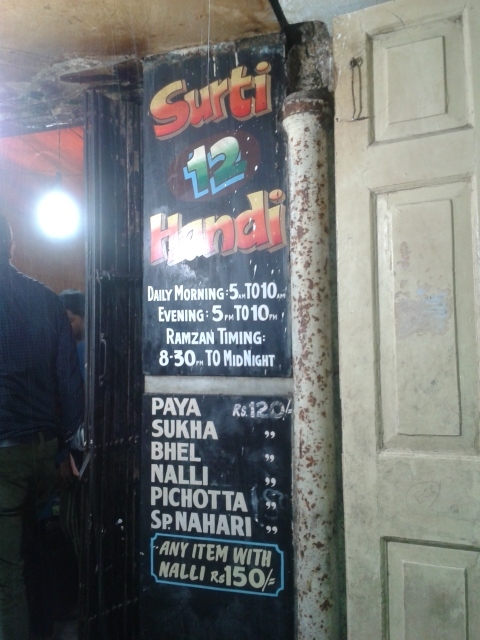 Surti 12 Handi came next. Various parts of the goat – gurda (kidney), kaleji (liver), pichota (tail), paya (trotters), etc are stewed separately in different vessels with various masalas. The curries are then mixed together. Unfortunately, I decided to skip the paya, as this kind of organ meat does not appeal to my palate or senses. Served with large Indian breads called Qabooz, my friends were enjoying it. We saved the best for the last. Tawakkal sweets was undoubtedly, the best place as far as I was concerned. 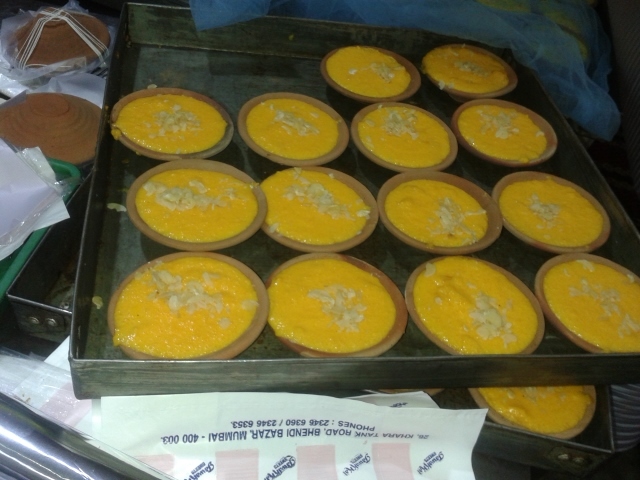 Melt in the mouth mango phirni, eggless and egg malpuas with malai, mango malai were some of the sweets we gorged on. Rich and creamy, these were enough to make one pile on calories in a jiffy, but we were indulging in guilty pleasure. 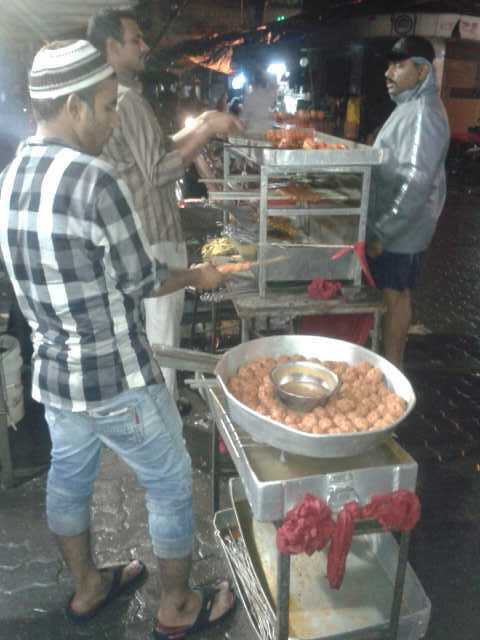 The person outside fried hot malpuas in a kadai, while another served phirni from packed trays arriving regularly from their workshop across. The saancha or hand churned ice cream at Taj Ice cream, I had heard so much about was a dampner. A real let down. I found it too synthetic and rich. The sitaphal flavour supposedly his best selling ice cream was disappointing. The mango was a bit better. But nothing could erase the memory of the mango phirni. The trip surpassed my expectations. My taste buds were satiated and after an enjoyable experience, we headed back home. This Ramzan would remain etched in my memory for a long time to come. Truly a haven for foodies, go there if you have not already. Dear Memsahib……my invite read. That set my pulse racing. It was like being transported to the style and elegance of the colonial era. I expected The Sahib Room & Kipling’s Bar at Palladium Hotel to be intimidating with a stiff-upper lip atmosphere, but I was wrong. 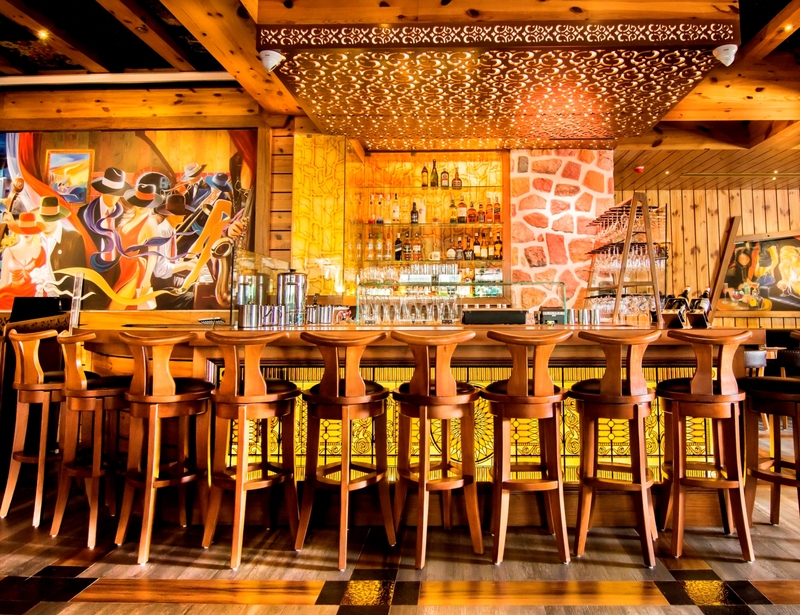 The restaurant and bar are well-designed and exude bon-vivant chic, but, with a warm and friendly vibe, which immediately puts you at ease. Sipping my Elaichi Daab- an interesting mix of coconut, almond and cardamom, I soaked in the ambience of this tastefully done up Kipling’s Bar. I couldn’t help notice a seat reserved for the famed writer Rudyard Kipling, with his spectacles, pipe et al who is supposedly away on a break. A while later we shifted to the Sahib Room for the rest of our meal. A superlative menu with Awadhi and North West frontier specialities greeted us. There was style and sophistication even in the manner in which the food was served. Phalon ka shorba- the spiced mandarin orange soup could not have been a better start to our gastronomic journey. A unique, mildly flavoured, refreshing soup. Easily one of the best I have ever tasted. 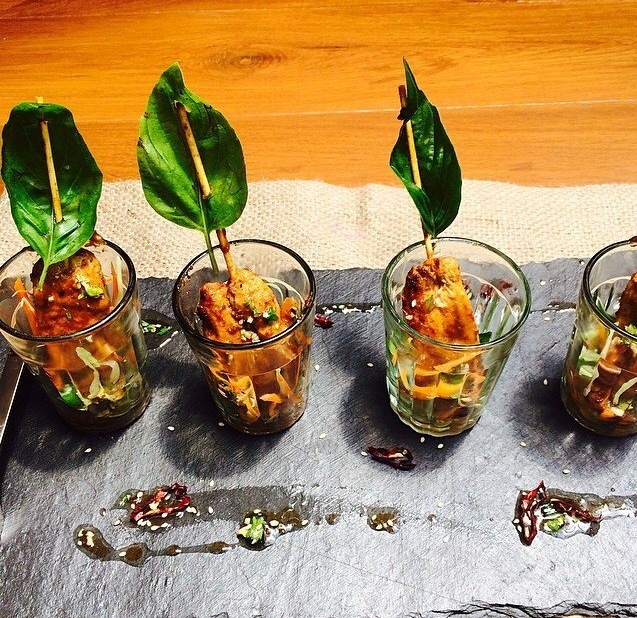 Dhungari Kumbh- Coal smoked forest mushrooms rubbed with fresh cilantro & ginger which came next, took my palate by storm. Melt-in-the mouth mushrooms with a smoky flavor were a never-before experience for my tastebuds. The idea of incorporating Philadelphia cream cheese in the Brocolli Dak Bangla appealed to me immensely. The cheese complimented the tart mustard flavor. We savoured each morsel in a relaxed atmosphere with attentive, but unobtrusive staff. Jaituni Pomfret was equally a delight with simple, rustic flavours. Nothing overpowering to mask the taste of the fish. And that is what good cooking is all about. There was no scope to go wrong with the Gongura Jhinga either. Succulent prawns, marinated to perfection. My tastebuds had experienced Nirvana already, but there was more to come. The zafrani taftan and tandoori naan paired well with the Murg Awadhi korma, which was strongly reminiscent of my grandmother’s cooking. Flavourful and comforting with freshly ground spices. The gravy was lip-smacking. Purvanchal saag was an amalgamation of fresh greens, with a hint of spice, just enough to tantalise your appetite. What can I say about the Sasranga meat? 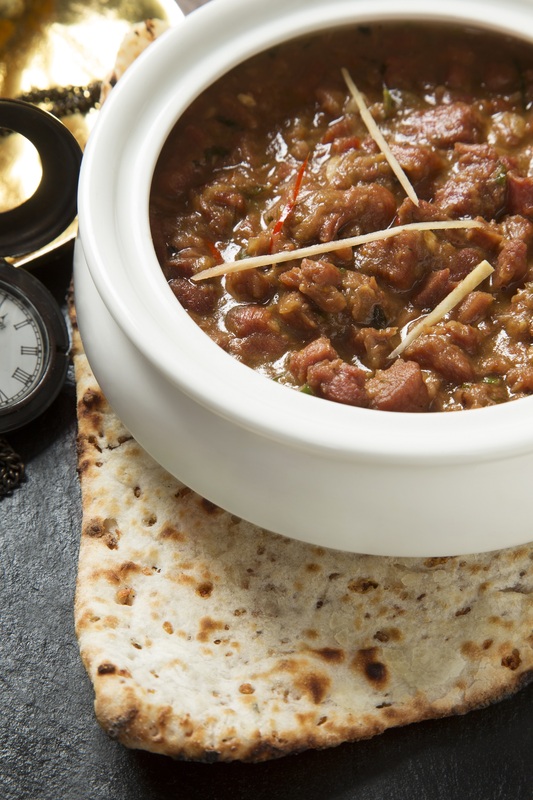 This Kashmiri preparation of lamb, with spices was the piece de resistance that evening. Cooked to perfection, the meat cubes were soft and creamy, meshed in a puree of aromatic spices, flavorful, yet, gentle on the palate. So delicious and satisfying was this, that we decided to skip the biryani, something I would normally never miss. Thanks to the fresh and quality ingredients, we did not feel uneasy after our meal. It was time for some guilty pleasure. The Kolkata meetha paan ice cream had strong paan flavours in a velvety texture, with the right amount of sweetness. In the same vein, was the paan rasogulla, but with different flavours, which lent themselves beautifully to the soft rasogulla. Angoori rabdi was rich and creamy in texture with a burst of sweetness in the mouth. An appropriate finale to a royal repast. Chef Paul Kinny and his team ensure you will go back for more. After SBX Sports Bar at Bhandup, being a huge let down, I walked into TAP, a sports bar from the China Gate group on Link Road Andheri with baited breath. The place looked snazzy, pulsating with music and sufficiently crowded for a Sunday night. The screens projected the FIFA World cup matches and the sports accessories and bric-a-brac matched to boot. The mood and ambience were clearly reminiscent of a sports bar. On the right track I thought. The service staff was lost. Too many of them running around in circles, but not really attentive to a guests’ needs. After catching the eye of one of them, we ordered our mocktails. We opted for an Orange Flute and Melon Ball. Both the drinks to our dismay were cloyingly sweet. Not as refreshing as I would have liked mine to be. The menu seems exhaustive- Mexican, Indian, Italian, Chinese. They have everything on offer. Yet, it is not too appealing for some reason. Too much choice maybe? Mole Polo a chicken dish arrived as our first starter. Roasted cubes of chicken in a mole sauce – red or green. That ‘s what the description stated. But sadly, no one asked us our preference. We were served the red one. The chicken pieces were chewy and almost tasted insipid. The sauce, a trifle better, did nothing to enhance the flavour. A real dampener. The Pablano Grilled Fish was relatively better. At least it was well marinated and tingled our taste buds to some extent. We were keen to try the Butterfly Prawns but were suggested Paprika Prawns Tonga instead. A poor mish mash of chicken and prawns, the dish did justice to neither. The chicken pieces completely overpowered the prawns flavour, resulting in a not- so exciting dish. To play it safe we opted for a Mexican cowboy salad. Not much scope to go wrong there. Decent fare but nothing to salvage our lost taste buds. We decided to skip the main course completely. The vibe and energy of the place is infectious and the music foot-tapping, albeit a bit loud as the hours tick by. A good mix of sports and entertainment, TAP is the perfect place to relax and unwind with friends and family but the food and service need to be stepped up for sure.